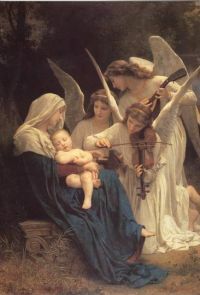 "Song of the Angels," by Adolphe-William Bouguereau, 1881. Welcome to the heart of this site, the gateway to the Hymns and Carols of Christmas. From here you can access all the Christmas-tide songs that I've collected in the last 20+ years. Certainly there are many traditions such as the sending of Christmas Cards, and singing Christmas hymns and carols, that are well worth preserving. The purpose of this site is to preserve a rich tradition of Christmas carols and hymns that might otherwise be lost. This is the largest collection of hymns and carols of Christmas ever published in the English language. Wherever possible, I attempt to provide the original, uncorrupted texts as first given by the author. In this desire, I am joined by the Late Lord Selborne, who explained his position in the Preface to The Book of Praise (1864). This site is called "The Hymns and Carols of Christmas." Concerning the hymns see The Theology of Christmas Music by Dr. Robert A. Pyne. Christmas-tide content from several collections, most with music, and which includes links to Latin hymn sources. Some translations from the Latin can be found in Edith Rickert's Glossary. On many pages, you will see links to "Noteworthy Composer files" and "XML files." For more information about these two formats, see: NWC & XML. It is with great pleasure, and a bit of sadness, to announce my retirement from the Hymns and Carols of Christmas, a website that I created in the year 2002. I am sad to be retiring as this website has been my primary activity for the last 12 years. But I'm pleased to announce that Mr. Richard Jordan has offered to take over the ownership of the site, thus guaranteeing its long-term existence. The notation "Text Only" means that the original collection contains just lyrics, and no music. However, many songs will have music from other collections. These collections are from identifiable dates in the history of English-language and European Christmas hymns and carols, and give a valuable look at how our ancestors celebrated both the holy day and the holiday up to six centuries ago. The Sloane Manuscript 2593 has been dated to the mid-15th Century. Thomas Wright, Songs and Carols from a Manuscript in the British Museum of the Fifteenth Century. This is the full listing of Christmas hymn and carol collections found on this website. New songs and collections of songs are continually being sought and incorporated into the site. Reprinted from the Edition of 1567, A. F. Mitchell, ed. (London: The Clarendon Press, 1962); Text Only; a limited selection, not the entire book. Joseph Ritson, ed., Ancient Songs and Ballads From the Reign of King Henry the Second to the Revolution. 1790. London: Reeves And Turner, 1877. Repr. Detroit, MI: Singing Tree Press, 1968. Twenty songs and carols from Sloane MS 2593. Additional translations from the Breviarium Parisiense. Thomas Wright and James Orchard Halliwell, Reliquiæ Antiquæ. London: Novello, 1853; With Music from The Condensed Vocal Parts to the Carols for Christmas-tide (London: Novello, 1854). The complete Sloane MS 2593, from which 20 poems were reprinted in 1836 by Wright (above). Hymns and Music For The Young - Parts One & Two - J. F. Young. Edmund Sedding, ed., Antient Carols for Christmas and Other Tides Arranged For Four Voices. Second Edition. (London: Masters and Son, 1863). Richard R. Terry, Old Christmas Carols. Part One. I would recommend this volume to the serious student of carols. A site devoted to making good songs better. Rev. John Mason Neale, Hymns of the Eastern Church (1862). Three very remarkable men in the 19th century compiled amongst themselves 16 invaluable collections of carols. A biographical note: Thomas Wright at Wikipedia. There are several other collections that received only limited circulation. A biographical note: George R. Woodward at Wikipedia. Twelve Christmas Carols (London: J. Curwen & Sons, Ltd., 1912). Old Christmas Carols. Part One. (London: Burns Oates & Washbourne Limited, 1923). Gilbert and Sandys' Christmas Carols (London: Burns, Oates & Washbourne, Ltd., 1931). Two Hundred Folk Carols (London: Burns Oates & Washbourne Limited, 1933). A biographical note: Richard R. Terry at Wikipedia. Includes links to other sites and to Amazon.com for printed collections, histories, etc. Hosts free scores of nearly 21,000 choral and vocal works. An increasingly large treasury of texts. Provides free access to hundreds of contemporary hymns and arrangements. Ed de Moel, ed., The Child Ballads. Multi-media video presentations about favorite carols from Ron Clancy, author of the Christmas Classics™ series of beautifully illustrated Christmas carol books. These videos provide great history about the carols and the people who created them. 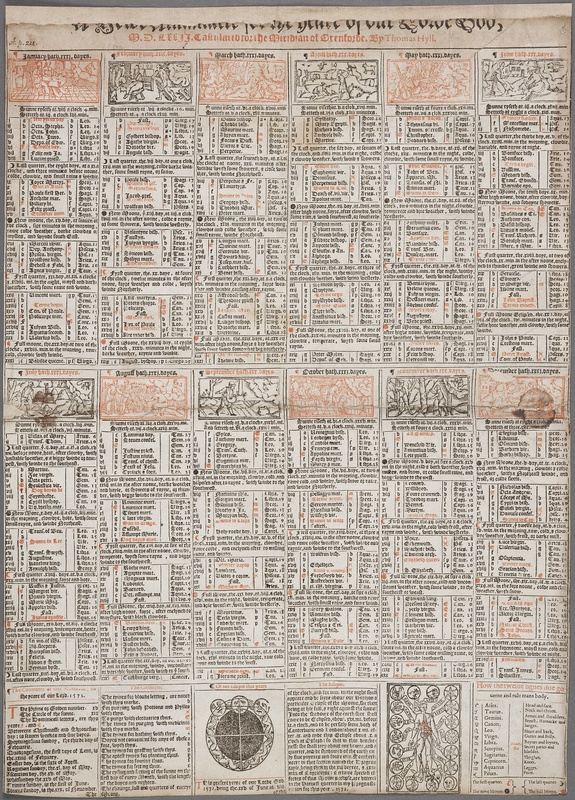 Showing the time for the rising and setting of the sun, the phases of the moon, general weather predictions, the seasons, Church feasts and festivals, and other information of value to citizens of the time. Easter occurred on April 1, and the first Sunday of Advent was Nov. 30. Holiday music brings holiday cheer! Listen to streaming Christmas music. A large listing can be located at Web Radio.